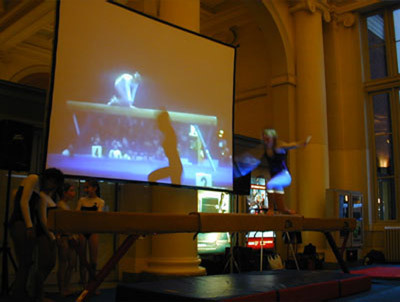 Nadia was a new work by Irene Loughlin based on Olympic Gymnast Nadia Comaneci's performance in the Montreal Olympics. 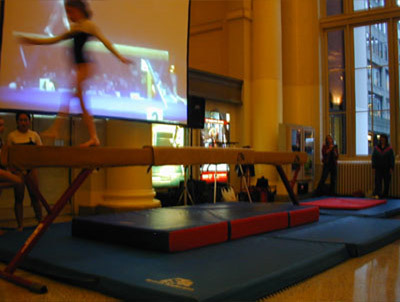 The work is produced in the Seabus Station in Downtown Vancouver during rush hour and consisted of a large projection of the 1970's parallel bars competition with a girl's gymnast team from a local high school performing live in front of the image. 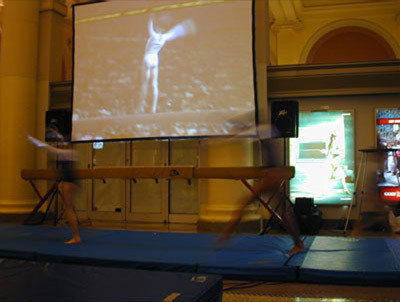 Beneath the video image is a text screen telling the reality of Comaneci's life including eating disorders that were featured in a 1980's TV movie about the athlete. The background to this work is of course Vancouver's bid for the 2010 Olympics. Loughlin shows the unglamorous reality of high level high pressure atheletes. Loughlin recently was awarded the Victor Martyn Lynch-Staunton Award for Interdisciplinary Work from the Canada Council for the Arts. Irene Loughlin is a performance artist who also works in the areas of installation and video. She has presented her work in various national and international contexts including the work "light as a feather/heavy as lead" for the Museo de Arte Contemporaneo and the Klaus Steinmetz Gallery (San Jose, Costa Rica), performances for The Western Front, Grunt Gallery, Xeno Gallery, Gallery Gachet, The Society for Disability Art and Culture (Vancouver), performative video/installations for The 7a11d Festival (Toronto), The Centre for Art Tapes (Halifax), and Projet/Projo at Studio 303 (Montreal). These works employ oddly inserted imagery, residues of trauma, juxtaposed elements, and awkward occasionally humourous moments, that are montage within installation and video environments, that paradoxically reflect the North American drive towards perfection, achievement, and relaxation. She has worked with images exploring and expanding upon constructs of illness and has questioned and reworked visual representations of trauma, suffering, and resistance. Irene Loughlin has studied at the Ontario College of Art and Simon Fraser University, and has attended the NSCAD studio program in Tribeca, NYC. 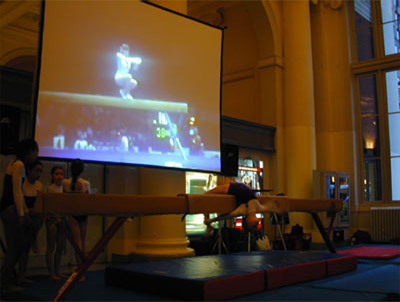 The links below launch video of "Nadia" in a pop-up window. A high-speed connection is required.